Chris Kaag, founder of the IM ABLE Foundation, will give a presentation titled “Becoming an Advocate for People with Disabilities” on Wednesday, March 1 at 7:30 p.m. in the Perkins Student Center Multipurpose Room, Penn State Berks. This event is free and open to the public. Chris Kaag is a Penn State Berks alumnus and retired Marine Corps Sergeant. 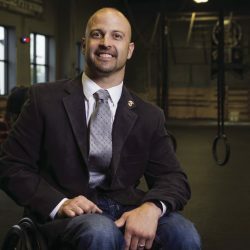 During his second tour in Aviano, Italy in 1997, a duty-related concussion led to the onset of a rare genetic neuro-degenerative condition and his military career came to an end. In 2007, Kaag established the non-profit, IM ABLE Foundation to help individuals with disabilities to build and support active lifestyles. The mission of the foundation is to help all individuals realize their potential to go further and push harder than their preconceived limits. Through his choice to view his own disability as a personal stepping-stone and not as a crutch, Kaag hopes to motivate others–both disabled and able-bodied–to redefine the way they view their own personal challenges. According to Kaag, everyone has obstacles, but it is up to the individual to take that next step.